Tesco will see the business rates bill for its biggest stores fall by £105m over the next five years, highlighting another anomaly created by the controversial tax. In Southwold, the coastal town’s property boom forced rateable values up by 152%, with some shop owner’s saying the hike threatened the viability of their business. Meanwhile, it emerged that online retailers such as Amazon, Shop Direct and Asos were enjoying tax cuts after the bills for their distribution centres declined. MPs on the communities and local government committee will question the communities secretary, Sajid Javid, about the revaluation on Wednesday. Javid has already promised to “level the playing field” between online retailers and high street shops, and the committee chairman, Clive Betts, said he would press for a timetable for a review. The Tesco store analysis by the business rates specialists CVS calculated that the bill for its largest stores in England and Wales would fall by £13m this year alone, from £450m to £437m. “Over the next five years, allowing for transitional relief which limits how quickly bills can rise and fall … CVS projects Tesco will save £105.32m in rates under the revaluation for its largest stores,” said its chief executive, Mark Rigby. “In comparison, across England and Wales small shops have seen their rateable values, used to determine bills, increase by 8.5% whilst pubs have seen a 14.36% hike. 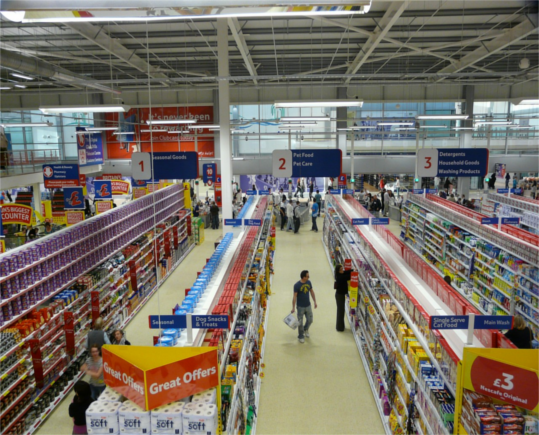 Tesco has 3,400 UK stores. The CVS figures is based on official data on its 563 largest shops, which are classed as superstores. The analysis estimates that the supermarket’s rateable value has fallen by 8.6% to £825.78m compared with 2010. It follows a 2015 writedown of the value Tesco’s property portfolio by £4.7bn. Tesco said the 2017 revaluation would not alter its status as one of the UK’s largest ratepayers and called for urgent reform of the system, which many business leaders agree is not fit for purpose.